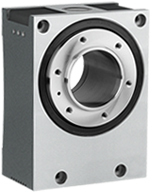 The STR 250V frame includes an inline planetary gearbox at its input; and allows an application to reach negligible backlash, maintain exceptional rigidity, and maximize control stability so that the desired output motion can be easily achieved. The design is truly a unique concept, utilizing a full contact screw-like transmission for high efficiency and elimination of wear. The unit provides maximum compactness using orthogonal axes and includes a large hollow shaft for flexibility.